The Dodge Challenger is an iconic muscle car that has been gracing the streets of America since its first generation Dodge Silver Challenger back in 1958. It has seen many different modifications, and is currently enjoying its third generation of impressive performance. The latest installment of the Dodge Challenger gives a nod back to the glory days, with Heritage features throughout the exterior and interior of the car. These little touches help make the 2015 Dodge Challenger reminiscent of years past, and is uniquely the only muscle car available on the market to do so. There are a lot of other updates that make the 2015 Challenger the best model year of the nameplate, ranging from new additions, to old inclusions. The most recent model year of the Dodge Challenger, the 2015 version, has seen plenty of upgrades, additions, and an overall updated look. The Challenger is widely known as the purest muscle car available on the market, with a design and drivetrain that outdoes Ford’s Mustang and Chevy’s Camaro. With a big list of updates for 2015, including the introduction of the Challenger SRT Hellcat, Dodge has never offered drivers more power, performance, and style, than they do with the 2015 Dodge Challenger. When engineers set out to create and design the 2015 Dodge Challenger, they had one main goal in mind: to reimagine the classic Challenger from its glory days, for the 21st century. The overall look of the 2015 Challenger, along with the power packed under the hood, is a winning combination that brings the past right into the future. Chrysler and Dodge set out to “rebirth an icon,” and they succeeded. 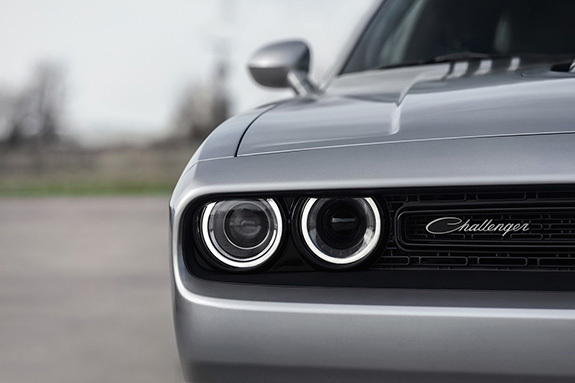 The exterior of the 2015 Challenger is reminiscent of the classic 1971 body style of the Challenger. From the iconic heritage-inspired split front grille, to the larger bulge hood, the new Challenger is truly like stepping back in time. That is, until you see all of the technology that Dodge packed underneath it’s sporty-tough exterior packaging. The 2015 Challenger features retro-style font and design of its interior controls and dash, with a completely customizable interface. When it comes to competitors like the Ford Mustang and the Chevy Camaro, there is no comparison to the classic styling and updated technology that Dodge fuses together in the 2015 Challenger. While the Challenger exudes retro style around every corner, Ford and Chevy created their sports cars with a more modern look overall, forgoing the look of the past for the feel of the future. The Challenger is able to offer old-school refinement, without sacrificing technology, comfort, and most importantly - power. For sports car enthusiasts who like power, performance, and a classic look - the 2015 Dodge Challenger is the perfect combination of the three. Despite the fact that the 2015 Challenger isn’t the beginning of a new generation for the Dodge nameplate, it still packs in enough changes and updates to satisfy any driver. Check out a few of the upgraded features for 2015, and see why the newest Challenger model is the best one yet. A brand new eight-speed ZF 8HP automatic transmission replaces the outdated 5-speed automatic transmission that came standard on previous model years. The 6.4-liter V8 engine on the 2015 Challenger helps to increase the overall horsepower by 15, bringing the new total to an impressive 485 horsepower. Bringing the old back in to be new again, is what the 2015 Challenger design team set out to accomplish. A retro-styled gauge cluster brings the classic Challenger look back into the muscle car’s interior cabin. If power, prestige, and styling are what you are looking for in your next muscle car - look no further. The all new 2015 Dodge Challenger SRT Hellcat is without a doubt, the most powerful muscle car ever made. Delivering a whopping 707 horsepower, and 650 lb.-ft. of torque, this 6.2-Liter Hellcat engine is the most powerful V8 ever made. In fact, the 2015 Dodge Challenger SRT Hellcat can reach 0-60 miles per hour in just 3.6 seconds, and has a top speed of 199 miles per hour. That’s fast, and that automatically makes the Challenger SRT Hellcat the most powerful muscle car on the road today, or in years past. No other automotive brand can compete with the ultimate power machine that IS the Hellcat SRT. With the TorqueFlight 8-speed automatic transmission, all of that power will be put to good use. Drivers will also be able to handle all of the Hellcat’s power with the manual 6-speed Tremec transmission. With either option, the Challenger SRT Hellcat will outperform every other car on the road. The 15.4-inch Brembo brake rotors ensure that the Challenger will stop when it needs to, which is important to note when you are driving the most powerful car on the road. Featuring 20-inch aluminum wheels, and an aerodynamic design to ensure that all that power doesn’t go to waste. The interior of the Hellcat is unlike any other Challenger trim, with standard Nappa leather seats, aluminum trim, heated and ventilated front seats, and a heated steering wheel, the Hellcat SRT exudes comfortable luxury at every turn. The Challenger SRT Hellcat comes packed with the most standard features of any other Challenger trim, and is the only trim level capable of producing the amount of power that the Hellcat can. If power, comfort, and safety are important, then driving the most powerful muscle car ever made, only makes sense.